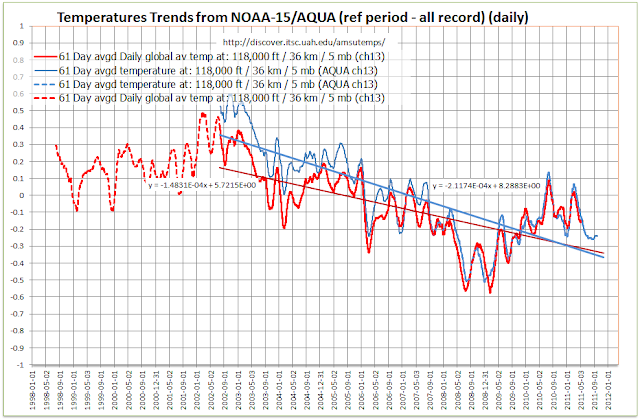 Many changes have been made to satellite derive temperatures ( I have asked Spencer to explain the differences and unrecorded adjustments on many blogs. BUT never has he bothered to explain). What goes up must (in earth orbit) eventually come down. 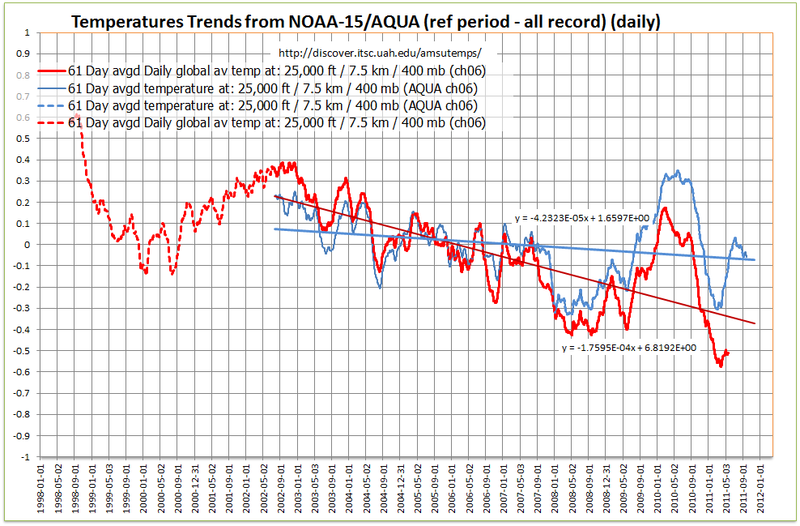 This gave a 6 year overlap where the temperatures could be compared and corrected. This, according to Leif Svalgaard is what happens with the TSI measurements for solar activity. 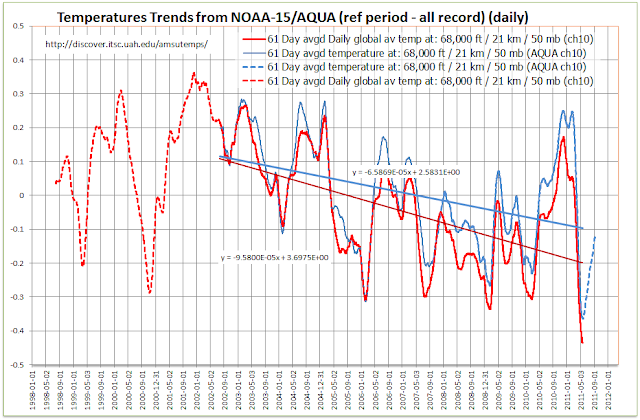 My complaint is that there is a LARGE error in data between AQUA and NOAA-15 and no attempt to reconcile the differences is made or explanations given. Indeed The UAH team handling the data seem to adjust data at a whim. 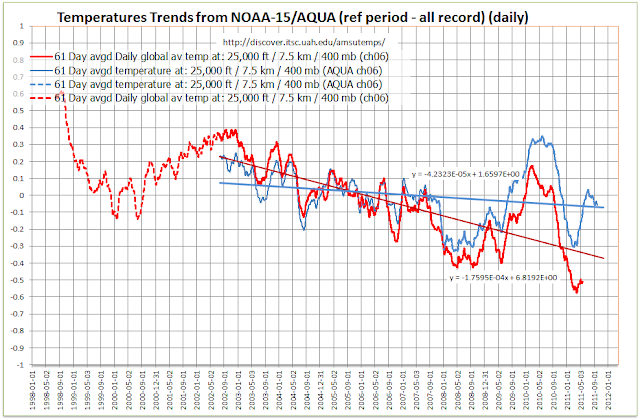 People are quibbling about discrepancies of 0.12 K/decade but looking at the comparison between NOAA-15 data and AQUA this 0.12K/decade is the discrepancies produced by the two satellites and modified by the same team. 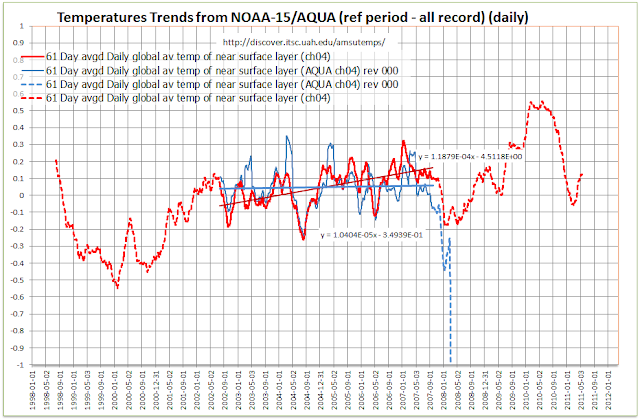 Looking at CH 4 data, the current data on their web site runs from 2002 to 2008 (with the last 6 monts failing) The data that was available (NOAA?) went from 1998 to 2011 and despite this being the longer record is not used on their Discover website. 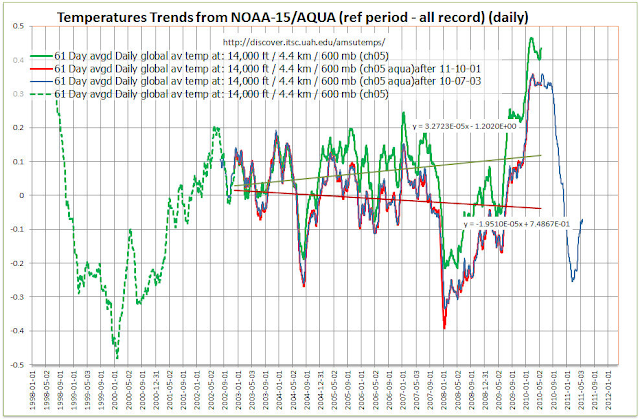 Another plot shows that CHLT (NOAA defunct) and CH04 (recently AQUA defunct) had peaks and troughs occurring at the same time. 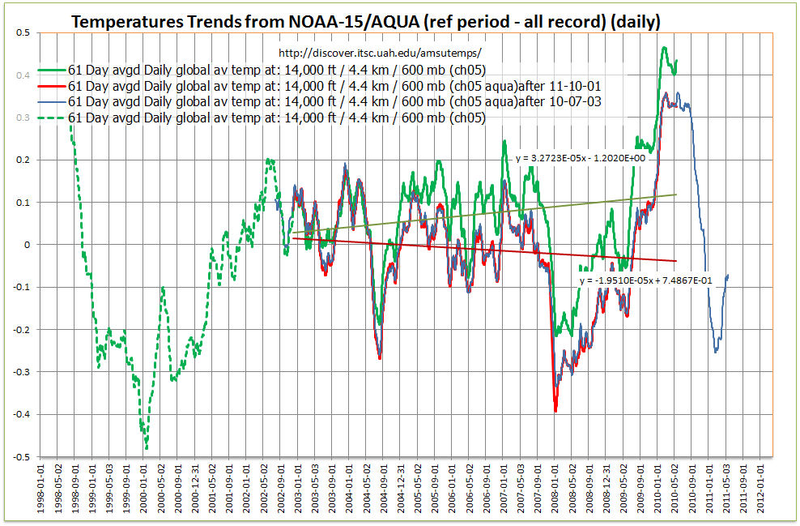 However comparing CH04 to Sea Surface temperature the temperature of the sea changes BEFORE the air temperature by a couple of months. HOW? 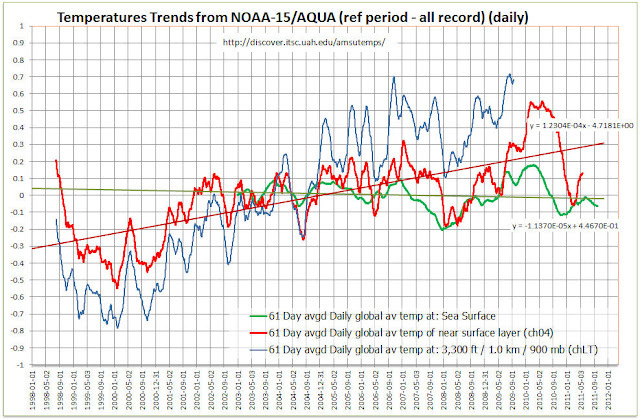 There seems to be many more problems with satellite temperatures than with surface temperatures. Why then are these held up as being the golden standard??? Check-out this excellent video of a talk by Ben Santer: Crushing the Myth of Global Cooling on Climate Denial Crock of the Week. 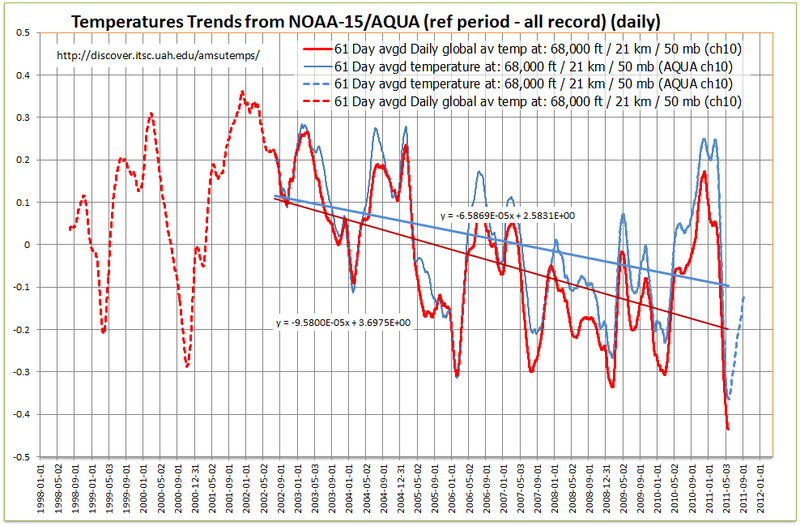 If you would have read the disclaimer at the Discover website, you would have realized you can't compare the daily, automated, quick-and-dirty data averages there with the fully intercalibrated, quality-controlled UAH dataset that we update every month. The Discover website data are meant to give a rough idea of how the latest month is shaping up compared to the same calendar month a year earlier, that's all. Hey lackofenvironment, I went to & watched that video. Excellent? It wasn't about Global Cooling & recently in the comments someone pointed out Santer's total failure to debunk the myths he set out to debunk. Showed that what Santer called myths were actually true. Roy The data is a couple of degrees adrift from satellite to satellite. This is not good! Why bother even giving the data if it so far out to be worthless? Although there is a statement ofn the discover page about accuracy it says nothing about adjustments. 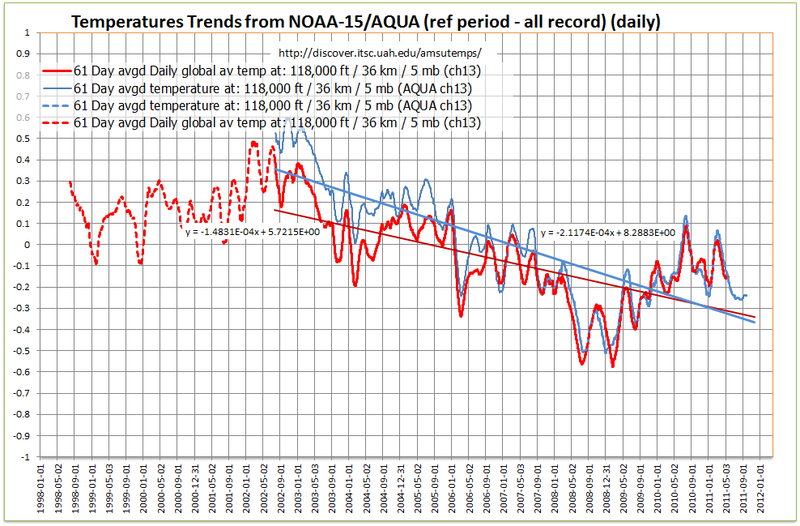 It says nothing about where similar but corrected data can be obtained. All-in-all this is a poor answer to my criticisms. If you can correct one series from sattelites , why not all. Or are the corrections too complex for a computer!!! 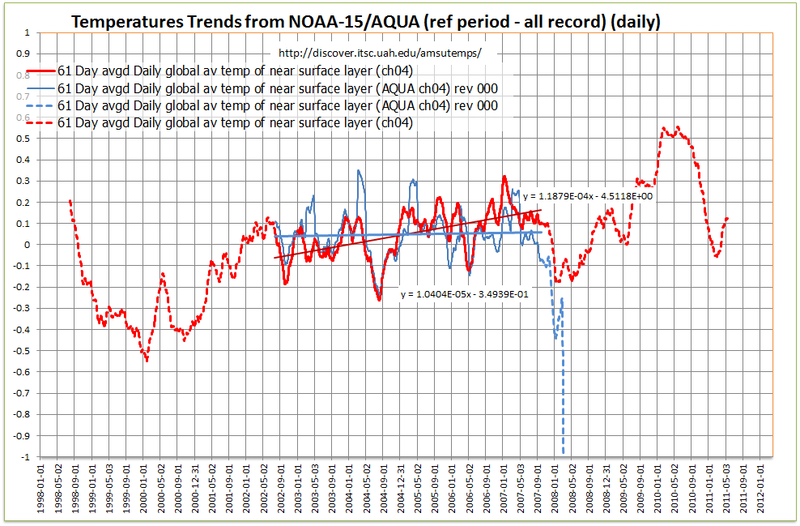 Please give a link to the adjustments made and data for similar altitudes that are approved by yourselves. Schnare snared, Horner cornered. ATI Gate?